Stuffed Chicken Breast: All are made from Bell and Evans All Natural Boneless Chicken Breast and fresh ingredients. 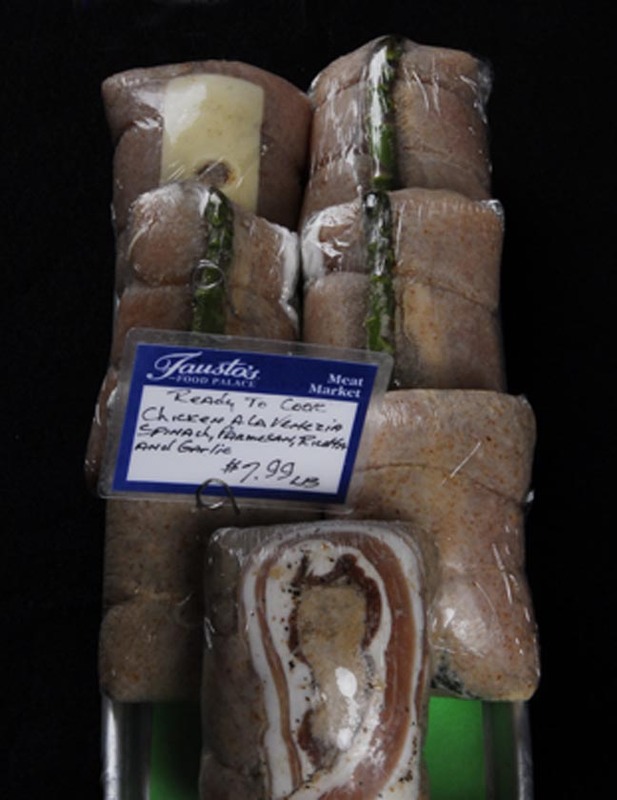 • Chicken Oscar: Swiss Cheese,& Asparagus, Olive Oil and rolled in Italian bread crumbs. • Chicken Cordon Bleu: Swiss Cheese and Smoked Ham, Olive Oil and rolled in Italian bread crumbs. • Chicken Diana: Feta Cheese crumbled, chopped Kalamata Olives, Italian seasoning Olive Oil and rolled in Italian bread crumbs. • Chicken Aristides: Sweet Italian Sausage, Blue Cheese, Garlic, Italian seasoning, Olive Oil and rolled in Italian bread crumbs. • Chicken Ala Venezia: Spinach, Parmesan Cheese, Ricotta Cheese, Garlic,Olive Oil and rolled in Italian bread crumbs. • Chicken Louie: Pepperoni, Mozzarella Cheese, Pepperoncini, Italian seasoning, Olive Oil and rolled in Italian bread crumbs. • Chicken Sherri: Kalamata and Green Olives, Parmesan, Garlic, Plain Stuffing, Olive Oil and rolled in Italian bread crumbs.